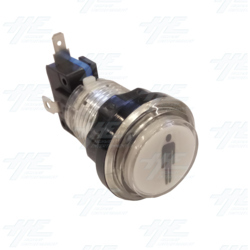 A clear illuminated 1 player push button with Microswitch and White LED that connects to 12 volts to illuminate the button for arcade machines. Made with high quality, heat resistant plastic, it features a long shaft designed for mounting in metal or wooden control panels. This new type of push button also comes with a securing nut and "Long Life" LED. It is ideal for "Start" buttons of arcade machine.